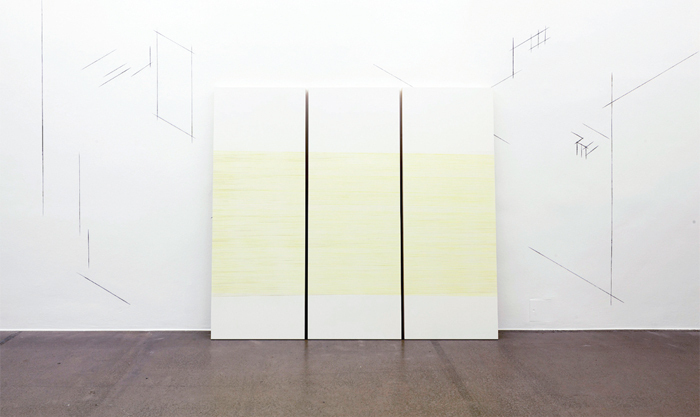 View of “Sofie Thorsen,” 2014. Foreground: Screen 2, 3, 4, 2014. Background: Screens Within Screens/1 (detail), 2014. “Just as axonometric projection eliminates every fixed, unique viewpoint,” writes Yve-Alain Bois in his essay “Metamorphoses of Axonometry” (1981/1983), “so it has been used throughout history in a multiple, contradictory fashion.” Sofie Thorsen’s recent work evokes parallel complexity, exploring axonometry through wall drawings and panels in a series of “Screens Within Screens,” 2014. While this title refers to one specific component of her work on viewmeshes of black-line wall drawings executed on three of Krobath’s five wallsit also describes the multiplication and interplay of distinct yet similar perspectives that defined the entire show.